This has been a bad year for fires across North America which hasn’t been helped by what many are calling the worst drought in 50 years. As of Friday there have been 5,612 fires in Canada & another 38,436 here in the US. This has resulted in nearly 8.5 million combined acres burned (4.4 US / 4.1Canada) with numerous houses & building lost. 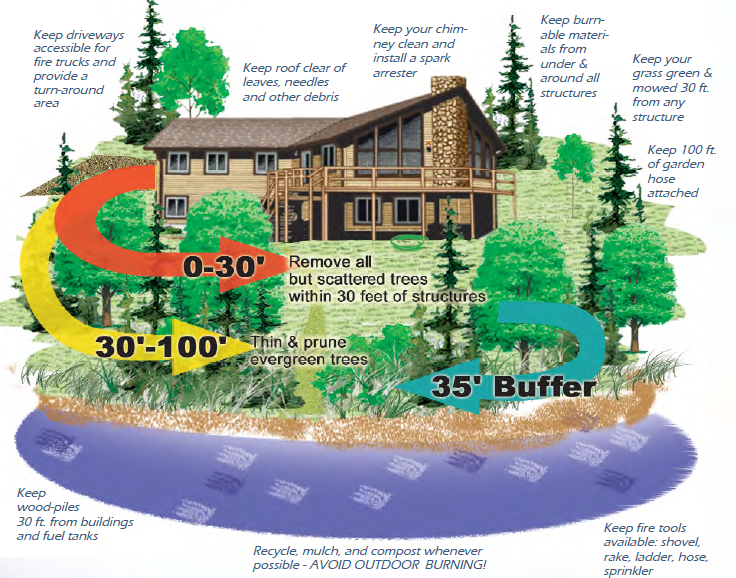 Have you cleaned up your buffer / defensible zone (see below) of old cars, lumber piles, downed trees, and other debris so firefighters can move around & protect all sides of your house? If you have fences separating parts of the yard, are the gates easily accessible & able to be opened with thick gloves? Have you trimmed back & eliminated all ladder fuels within a 100’ or more from the house? This is mainly completed by mowing or bush-whacking tall grasses, trimming shrubs & pruning all the lower branches of trees up six to ten feet. A ten foot spacing from branches is also recommended from evergreens. Have you cleaned up all leaves, needles & fallen branches around any foundation plantings, next to the building and under your decks? Have you considered using stone or rock next to your foundation instead of foundation plantings, & mulch? Planning a renovation or an addition? Consider using less flammable materials such as brick, stone and metal. Check your fireplace to ensure the chimney cap assembly will block sparks (from not only getting out but in) along with looking for cracks in the brick and liners. Roofs & gutters are a big concern because of how easily they trap & hold leaves, needles and twigs, so make sure they are cleaned out regularly. The heat given off by a fire is amazing and can light draperies on fire, so you might want to consider installing protective shutters or fire resistant drapes. Have you installed noncombustible 1/4 inch or smaller mesh screening on attic/soffit vents and if needed around elevated wood decks to help keep out embers. While a garden hose is woefully inadequate for a large fire, having one set up can help wet things down before hand or prevent a small fire from growing into a larger one. Last but certainly not least – do you have working smoke detectors in your home? Hopefully with a little common sense & this checklist your home will be safe if the worst should happen. Speaking of common sense, there is some good news coming out of this drought; namely that people are finally starting to look a little closer into the Ethanol lie.